1979-11-01. New. Ships with Tracking Number! INTERNATIONAL WORLDWIDE Shipping available. Buy with confidence, excellent customer service! AN ACTOR AND HIS TIME. SIDGWICK & JACKSON. LONDON 1979. Fine. 1979. First Edition. Hardcover. SIGNED & dated by John Gielgud on the front endpaper. Fine in dj. (LR); Signed by Author(s) . 2000-08-07. New. Ships with Tracking Number! INTERNATIONAL WORLDWIDE Shipping available. Buy with confidence, excellent customer service! 1982-05-27. New. Ships with Tracking Number! INTERNATIONAL WORLDWIDE Shipping available. Buy with confidence, excellent customer service! London: Sidgwick & Jackson, 1979. In collaboration with John Miller and John Powell. Price-clipped.. Signed by Author. First Edition. Cloth. Very Good/Very Good. 8vo - over 7¾" - 9¾" tall. Signed by Author(s) 0 Presentation Copy from John Gielgud, Signed and dated Directly to Ffep plus a compliments slip laid in 'With the Compliments of Sir John Gielgud' VG clean and tight condition. Minor shellf wear to edges. Dustjacket not price clipped. 1982-05-27. Good. Ships with Tracking Number! INTERNATIONAL WORLDWIDE Shipping available. May not contain Access Codes or Supplements. May be ex-library. Shipping & Handling by region. Buy with confidence, excellent customer service! Applause Theatre & Cinema Books, 2000-04-01. Hardcover. Used:Good. London: Sidgwick & Jackson, 1979. 253pp. Illustrated. Original brownish orange tweed cloth with spine lettering stamped in silver foil. This copy briefly inscribed and signed by the author on the front free endpaper. The author was dominant in British theatre and film in the 20th century, along with Laurence Olivier and Ralph Richardson. He was accorded a host of honors including the Legion of Honor (1960) and the Order of Merit (1996). Size: 8vo - over 7¾ - 9¾" tall. Signed by Author. First Edition.. Original Cloth. Fine/Fine. London: Sidgwick & Jackson, 1979 Inscribed on fep " To Roy Best Wishes John Gielgud 1975 " The book is in fine condition; dj (unclipped) has very slight wear to the edges and a little fading to the spine. Signed by Author. First Edition. Cloth. Fine/Near Fine. 8vo - over 7¾" - 9¾" tall. Applause Theatre & Cinema Books. Hardcover. 1557832994 New Condition. . New. Applause Theatre & Cinema Books. PAPERBACK. 1557834156 New Condition. . New. Penguin Books, 1982-05-01. Paperback. Used:Good. London: Sidgwick & Jackson. Fine+ in Fine dust jacket. 1979. First Edition; First Printing. Hardcover, illus.. 0283985739 . Book As New, no notes or other names. DJ with slight nicks at REAR, else like new. DJ not price clipped (£8.95) ; Flat signed by Gielgud at FEP in 1975. NOT inscribed. ; 253 pages; Signed by Author . London: Sidgwick & Jackson. This is a Very Good + Copy of this book in Publisher's brown cloth with silver title lettering to spine,in a Very Good Dust-Jacket that has just one small nick to the dust-wrapper along top edge of the upper cover.Not price clipped (no price present) and this copy has been SIGNED by John Gielgud on the ffep without dedication.Rare signed copy of this prolific actor and master of his craft,8vo 253pp Fiirst Edition 1st Impression  . Very Good+. Hardcover. First Edition. 1st Printing. 1979. Applause Theatre & Cinema Books. Hardcover. 1557832994 Like New Condition. . Fine. Applause Theatre & Cinema Books. PAPERBACK. 1557834156 Like New Condition. . Fine. London: Pan MacMillan. Hardcover. 0283985739 . Fine. 1979. New York: Applause Books, 1997. Fine. Advance Reading Copy. Fine in wrappers. London: Pan MacMillan. Hardcover. 0283985739 Signed and inscribed by the Author on the FEP. . Fine. 1979. 1st Edition. 0 From The Library of the Actor Leonard Rossiter. First Edition/First Printing Published by Sidgwick & Jackson, London 1979. VG Clean condition with no marks or inscriptions. Dustjacket Price Clipped. Sidgwick & Jackson, 1979. Hardcover. Good. Applause Theatre & Cinema Books, 2000-02-01. Paperback. Used:Good. London England: Sidgewick & Jackson Ltd, 1979. 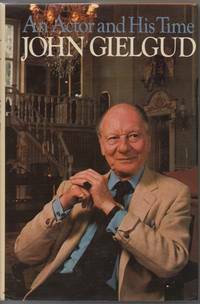 In this book, John Gielgud tells the story of his life in the theatre, of the plays he starred in, and directed, of the actors and actresses he worked with. He also tells of the theatre he knew as a young man. With the aid of many photographs from his own collection, Sir John Gielgud has made this book not only a fascinating account of his own life, but also a well documented record of the last fifty years of the British theatre. Illustrated. Price clipped. Slight wear to D/J. Message to owner inside cover.We carry a wide selection of titles in The Arts, Theology, History, Politics, Social and Physical Sciences. academic and scholarly books and Modern First Editions ,and all types of Academic Literature.). First Edition. Boards. Very Good/Very Good. 8vo - over 7¾" - 9¾" tall. Hardback. Applause Theatre & Cinema Books. PAPERBACK. 1557834156 Special order direct from the distributor . New. London: Sidgwick & Jackson, 1989. 300 pages. Book appears to have hardly been read and is in Fine condition throughout. This Records The Life Of This Most Highly Acclaimed Actor, Right Up To The Present Day. Reprint. Soft Cover. Fine/None Issued. London England: Sidgewick & Jackson Ltd, 1979. In this book, John Gielgud tells the story of his life in the theatre, of the plays he starred in, and directed, of the actors and actresses he worked with. He also tells of the theatre he knew as a young man. With the aid of many photographs from his own collection, Sir John Gielgud has made this book not only a fascinating account of his own life, but also a well documented record of the last fifty years of the British theatre. Illustrated. Price clipped. Slight wear to D/J. Message to owner inside cover.We carry a wide selection of titles in The Arts, Theology, History, Politics, Social and Physical Sciences. academic and scholarly books and Modern First Editions ,and all types of Academic Literature.). First Edition. Boards. Very Good/Good. 8vo - over 7¾" - 9¾" tall. Hardback. London: Sidgwick & Jackson Ltd., 1989. Signed and dated by author. Softcover with slightly creased spine and contents in very good clean condition. Top of page block is very lightly soiled. Newspaper article inside book. T. Signed by Author. Second Edition, Revised and Updated. paperback. Very Good/No Dust Jacket. Used. London: Sidgwick & Jackson, 1989. 300 pages. Book appears to have hardly been read and is in As new condition throughout. This Records The Life Of This Most Highly Acclaimed Actor, Right Up To The Present Day. Reprint. Soft Cover. As New/None Issued. Applause Books, 2000-04-01. Hardcover. Good. PHILADELPHIA, PA: THE WESTMINISTER PRESS, 1977. PAPERBACK. VG. Melbourne: Hutchinson Group [Australia]. 1979. Large octavo size [16x24cm approx]. Fine condition in a Near Fine Dustjacket - DJ now protected in purpose-made plastic sleeve. An excellent copy. Illustrated with Colour and Black & White Photographs. 253 pages . 1st Australian Edition. Hardback. Applause. PAPERBACK. 1557834156 . New. Applause Theatre & Cinema Books. PAPERBACK. 1557834156 Brand New! Not overstocks or remainder copy! . New. Applause Books, 2000-02-01. Paperback. Good. London: Sidgwick and Jackson, 1975. A near Fine unmarked copy with near Fine dustjacket. 253 pages. 12 colour plates and 112 black and white illustrations. In this book Sir John Gielgud tells the story of his life in the theatre, of the plays he starred in, and directed, of the actors and actresses he worked with - from Mrs. Patrick Campbell to Richard Burton - and of the theatres in which he has played - from New York to Rangoon. He also tells of the theatre he knew as a young man, the theatre that was run by the great actor/managers, men like Tree and du Maurier, and of the star actresses whose name alone could fill a theatre - Eleonora Duse, Sarah Bernhardt, and, of course, his own great-aunt, Ellen Terry. With the aid of many photographs from his own collection, he recounts not only his own life, but also a well documented history of the British theatre. **** A HEAVY VOLUME OF 0.9 KILO UNPACKED WEIGHT WHICH MAY REQUIRE EXTRA SHIPPING COST **** 24. First. Hard Cover. Near Fine/Near Fine. 8vo - over 7¾" - 9¾" tall. Sidgwick & jackson 1st 1979 . 8vo F/VG++ 825 gms. London: Sidgwick & Jackson, 1979. In collaboration with John Miller and John Powell. Silver title on brown cloth boards - a near Fine copy. Dustjacket has coloured photograph of Gielgud to front with photographs in black and white of some of his roles to rear and is near Fine.12 coloured plates and 111 black and white illustrations. A fascinating autobiography by undoubtedly one of the greatest actors of the twentieth century profusely illustrated with many photographs from his own collection. **** A HEAVY VOLUME OF 0.9 KILO UNPACKED WEIGHT WHICH MAY REQUIRE EXTRA SHIPPING COST **** 24. First Edition. Hard Cover. Near Fine/Near Fine. 8vo - over 7¾" - 9¾" tall. London: Sidgwick & Jackson, 1979. First Edition. Hardcover. Very Good. 1st printing. Written in collaborations with John Miller and John Powell. 8vo. Pp 253 illustrated with b&w photographs throughout. Yellow ochre cloth boards stamped in silver on the spine. A clean, unmarked copy in a tight binding and unclipped dust jacket.